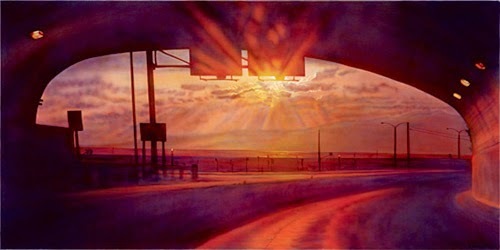 I recently came across Los Angeles area artist Susan Haskell's painting of the McClure Tunnel. 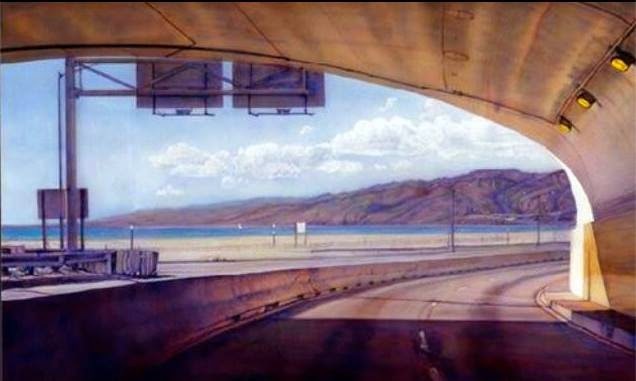 Beautiful work that captures the awe of coming out of the tunnel at the end of the Santa Monica Freeway and out onto the Pacific Coast Highway. There are many stunning views in Los Angeles, but in terms of views that can only be experienced while driving, the view at the end of the McClure Tunnel ranks at the very top. 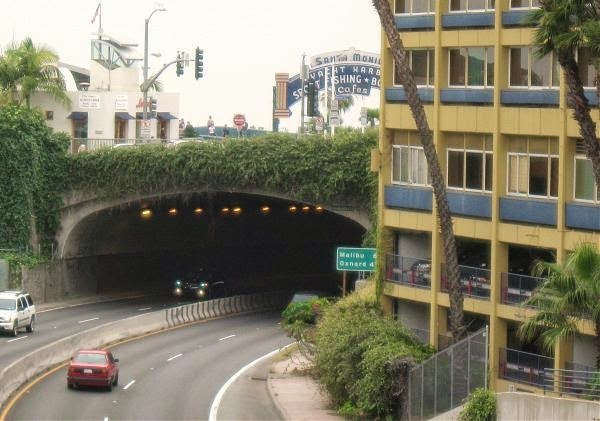 The Santa Monica Freeway, which starts 2500 miles (4000 km) away in Jacksonville, Florida - ends at the tunnel, which curves and opens up of the Pacific Ocean. The tunnel was actually built in 1935 and is only 400 feet long. The curve, keeping the ocean from view until you emerge from it, is what makes it so unique. I remember the first time coming through the tunnel at age 7, when my family moved from Chicago to Los Angeles. Seeing the Pacific Ocean and the Santa Monica Mountains for the first time was stunning then. And it's still stunning. Sort of. I would NEVER recommend trying to take a photo coming out of the tunnel while trying to navigate a dark curving tunnel with traffic - very dangerous. Google street view is the next best thing. What was once one of the most stunning views in Los Angeles is marred by Cal Trans decision to place a work yard, complete with large metal storage bins, right at the mouth of the tunnel. Really? Los Angeles is a huge place. They couldn't find another place for this? Here's an ariel shot. Gives a better idea of what seems like an incredibly stupid decision. Like other major cities Los Angeles faces a list of challenging problems. I'm sure "marring the view coming out of the McClure Tunnel" is not on the top of the list. On the other hand, it's the hundreds of little things like this that can make living anywhere delightful or loathsome. Kind of like graffiti or trash along the road. Susan Haskell obviously knows a beautiful subject when she sees it. Here's the same shot, only a sunset. 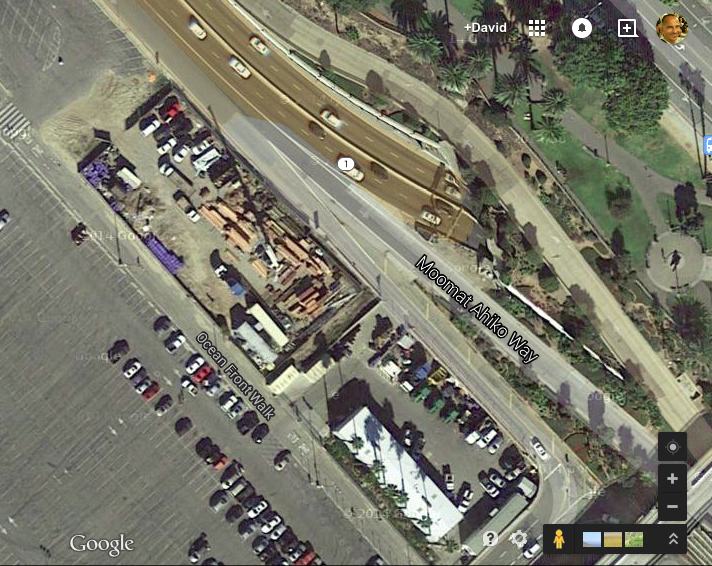 And here's hoping that the Cal Trans storage yard will find another home. And this one small part of experiencing Los Angeles will be restored to how it was originally envisioned. You're right about caltrans, why would they put those trash bins their. Other than that, Santa Monica is spectacular. Do they somehow see it as a safety precaution perhaps? In case people coming out of the tunnel are lulled into a frozen state of euphoria at the sight of the ocean, those big uglies can help stop their cars from accidents...?